Failure to flag the Rams for blatant pass interference late in the fourth quarter probably cost the Saints a trip to the Super Bowl. In the wake of Sunday’s game-changing non-call on what should have been a pass-interference penalty in the NFC Championship Game, it’s time for the NFL to take the significant step of including penalties in the instant replay review process. It’s time for all calls — or, as was the case in the Rams-Saints game, all non-calls — to be placed under the umbrella of replay. The decision not to call a penalty on Rams cornerback Nickell Robey-Coleman — who saved a potential touchdown by intentionally colliding with Tommylee Lewis at the 6 well before Drew Brees’ third-down pass reached him — left the Saints with no choice but to attempt a 31-yard field goal with 1:41 remaining in regulation. If the penalty had been called, they could have scored a touchdown or bled the clock with three runs and kicked a chip-shot winner with almost no time left. Wil Lutz’s kick gave the Saints a 23-20 lead, but the Rams had enough time to drive down the field. Greg Zuerlein’s 48-yard field goal tied the score with 15 seconds left, and shortly after the Rams intercepted Brees in overtime, Zuerlein’s 57-yard field goal won it. Almost immediately, the NFL admitted the call had been botched. 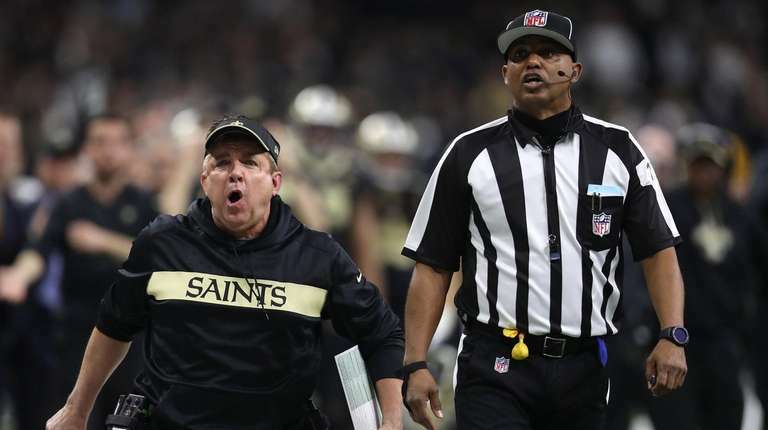 After the game, NFL senior director of officiating Al Riveron told Saints coach Sean Payton that interference should have been called. He’s right about that, too. No other team should lose like that. Which is why the league needs to include plays like this in replay review. The Patriots in recent years floated a proposal to the competition committee that all plays be subject to review — whether it be a coach’s challenge or a booth review in the final two minutes of each half or the entirety of overtime. There needs to be a mechanism in which obvious missed calls can be overturned if there is indisputable evidence that the wrong decision was made. Replay covers changes of possession, scoring plays, receptions, muffed punts and a few other reviewable plays. The league has resisted including penalties in the replay system because of the subjective nature of the calls. Competition committee members convinced owners over the years that they’d be going down a slippery slope if they included pass interference, holding or other penalties. Perhaps a recently named member of the competition committee could suggest that it’s time to change that way of thinking. That newly named member would be Payton. He undoubtedly will lobby to expand the replay system to include penalties. With fresh evidence of just how damaging a missed call can be, perhaps he’ll be able to convince the committee and the minimum of 24 owners required to pass a rule change. He’ll have the support of at least one owner — Gayle Benson. It doesn’t have to happen again. It’s time to change the rules and correct obvious bad calls that can mean the difference between going to the Super Bowl and going home.